Discoveries in Health Policy: Brief Blog: Harry Glorikian Publishes Book, "Commercializing Novel IVDs"
Brief Blog: Harry Glorikian Publishes Book, "Commercializing Novel IVDs"
Industry expert Harry Glorikian has published a book (available January 5, 2017) called, "Commercializing Novel IVDs: A Comprehensive Manual for Success." The book will be available as a specialty industry report from Insight Pharma Reports, with a current list price of $695. The executive summary is online here. Book homepage and table of contents, here. Estore, via Cambridge Healthtech Institute, here. Publisher's Description after the break. For a September 2016 interview with Glorikian, see Slone Partners, here. For a February 2017 interview at Genomweb(subscription), here. How do I approach the regulatory process? How can I plan for market access, and what can I do to make sure my IVD will be reimbursed? This is not a checklist or how-to manual with step-by-step instructions to build an IVD. 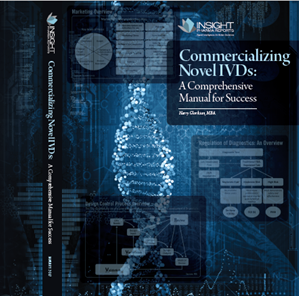 It is meant to provide an overview of the major components to IVD development, from product conception through commercialization, and important considerations about individual aspects of the process: How do I approach the regulatory process? How can I plan for market access, and what can I do to make sure my IVD will be reimbursed? These ideas don’t exist in a silo, but people are so focused on individual steps in the process they are responsible for, that the overall picture is sometimes missed. This is understandable—no one person can be an expert on every aspect of the IVD development process. The scientists in the lab may have little to no understanding about the different regulatory options and requirements that influence an IVD, and the sales staff may not completely understand the engineering process; neither is expected to! But it’s essential to understand and identify the necessary job functions to move an IVD from product ideation through successful commercialization. This book attempts to do that by describing the overall process of IVD development, who needs to be involved, and highlighting challenges and points to consider along the way. Glorikian's 2014-2015 blog is here.